Boxcutters, Jigger, Citrus Juicer, Strainer, Stirrer (long Spoon), Straws, Collins Glass. Add all Ingredients except the Soda and garnish to a cocktail shaker half-filled with ice. Shake well and strain into a Tall (10 ounce or so) glass filled with ice cubes. Top up with Soda (about an ounce-more if you need to fill the glass), then add a straw and stir to mix. 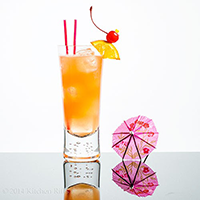 Garnish with an Orange Slice and a Maraschino Cherry, and serve.